Deciding to invest in a pitching machine is arguably the best decision that any baseball player who is keen on perfecting his skills can make. 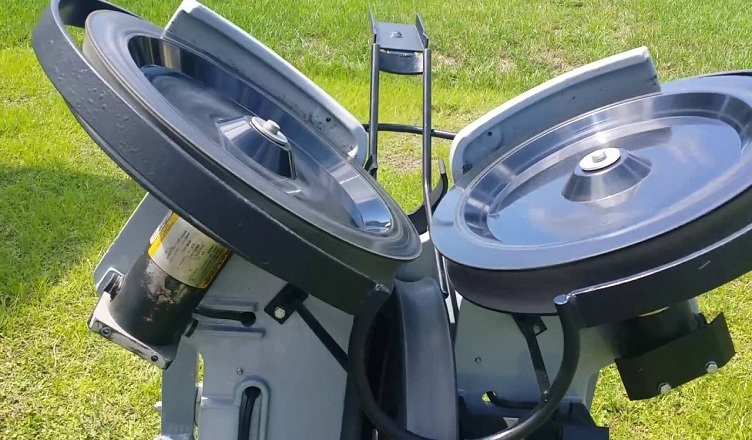 Since these machines can be quite expensive, it is therefore necessary to do detailed research and analysis of The Best Pitching Machines to purchase depending on your budget. Before you make the final decision, there are numerous factors you need to put into consideration so that you are able to make an informed decision. It is always a good idea to consider checking the qualities of the product you are interested in to ascertain whether the machine will suit your playing style. For players looking for a product that is specially designed for baseball players who are interested in taking their batting skills to a whole new level, then this Sports Attack machine is the machine to purchase. 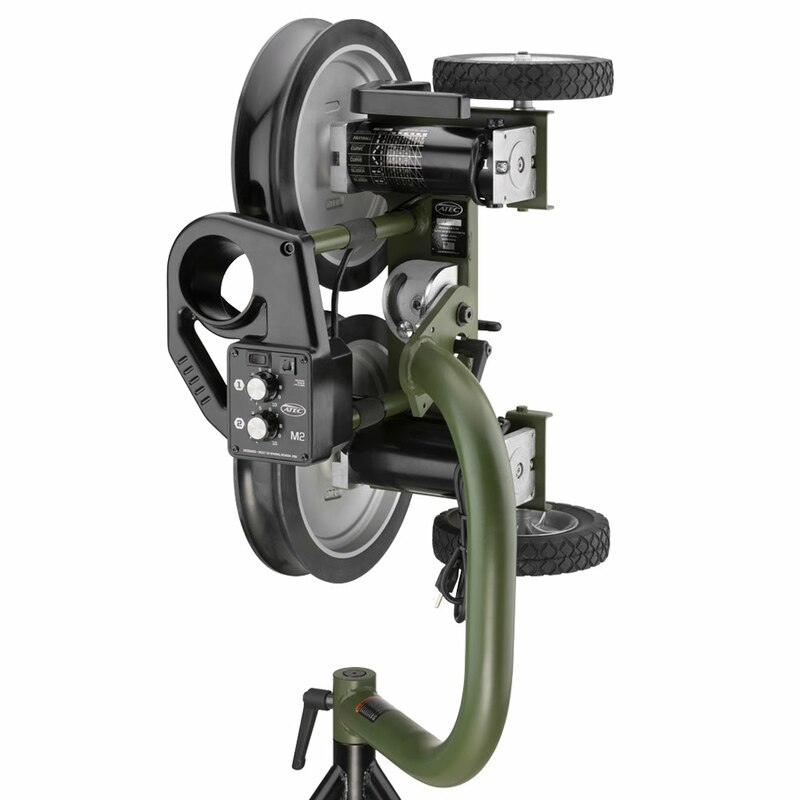 The machine features a classy three-wheel design that allows players to follow the ball right from the feeding motion to release just as it was a live pitcher throwing the ball. This enables the players to prepare themselves well and stand in a ready stance in readiness to hit the ball after swinging. What is more amazing about this product is that in addition to enhancing a players’ hitting skills it also helps in streamlining timing and accuracy skills. There are arguably very few pitching machines that are designed for use by players of all the levels of baseball. This Junior Hack Attack product is one of those products as it can be used for freelance practicing in the backyard, high school, college, youth leagues and even for professional baseball training. 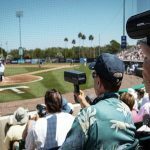 As such, the product is a perfect purchase for a family of baseball enthusiasts as it can be used by virtually anyone at home without any setbacks whatsoever. Do you want to polish your batting skills on ground balls, fly balls or even line drives? If yes then you should look no further than at this product. This is because the product is designed to throw fly balls, ground balls, pop-ups, fly balls and curve balls. In addition to this, you can set the product to throw balls at your preferred speeds and at different angles depending on the landscape of the pitch you are training on. For baseball players who love practicing away from home with their friends, this is the ideal pitching machine for them. This is because the machine features a portable design and can be folded into a compact size thus making it easy to fit the product even in a small car such as a Mini Cooper. Additionally, it is considerably lightweight and hence can be carried from one point to the other on the pitch without much hassle. This Sports Attack prides itself in having a top throwing speed of 70+mph. Since the machine is used for different levels of baseball practice, the speed is variable to feature low throwing speeds for amateurs and high speeds for skilled players. 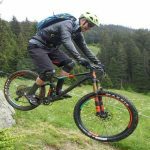 The machine has a full 360-degree rotation feature that makes it easy to use the machine on different landscapes or terrains. Additionally, the rotation feature also enables the machine to throw different types of pitches; all thrown at different angles. Pitching machine for everyone- With this product, you need not worry about buying another product for your kids to use for their pitching practice. The machine does not require assembly as it is ready to use right from the box. Features high-level safety standards hence ideal for use by kids and youthful players. Great product that is exceptionally reliable throughout its life. The product is quite pricey compared to other standard pitching machines. 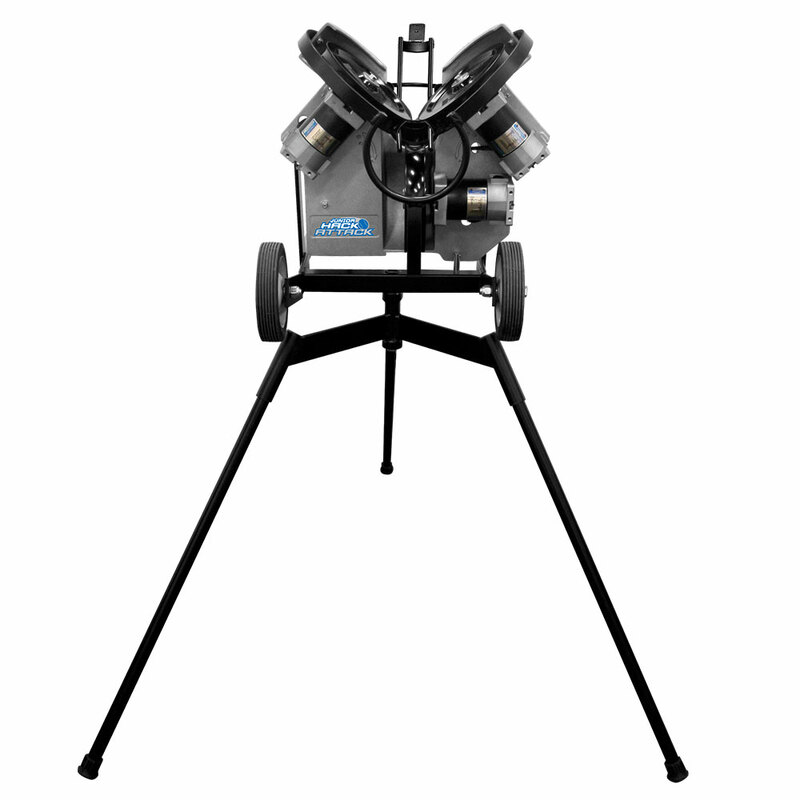 The Mound Yeti Pitching Machine reigns as the best two wheel-pitching machines for amateur and professional baseball players. If affordability and pricing are your top concerns when shopping for these machines, you should look no further than at this product as it is considerably affordable than most other machines in its class. The product is ideal for the entire since it offers different functionalities for fielding and practice hitting. The Mound Yeti product comes with a micro-adjustment technology that allows players to alternate between baseball and softball practicing. You can also use the technology to make changes in type, velocity, and location of the balls being thrown depending on your playing preferences. The best thing about the product is that you can also use it for both outfield and infield practice, the speed capability is between 30 and 90 mph. For players wishing to feel an authentic practicing feel and experience, the machine boasts of having several throwing techniques. These include sliders, fastballs, breaking balls, and knuckleballs. This unlimited functionality of the pitching machine makes it possible to simulate top level pitching and gain classy batting skills like those of pro-players. You can set the product to throw fastballs up and in at different angles and velocities depending on the skills you are practicing or polishing. Unlike other pitching machines that are susceptible to breaking down from time to time, this product guarantees to provide its users with seamless performance throughout its life. As such, you can rely on the product for all your training needs to perfect and polish your batting skills to the level you want. Two in one machine as it can be used for both baseball and softball. Comes with adjustable leg stands to adjust the height of the machine to your preferences. Unwavering accuracy and performance throughout the machine’s life. Powered by electricity hence its use is limited to areas with electric power or generator. The beauty of this Jugs Pitching Machine is in its classy simplicity. 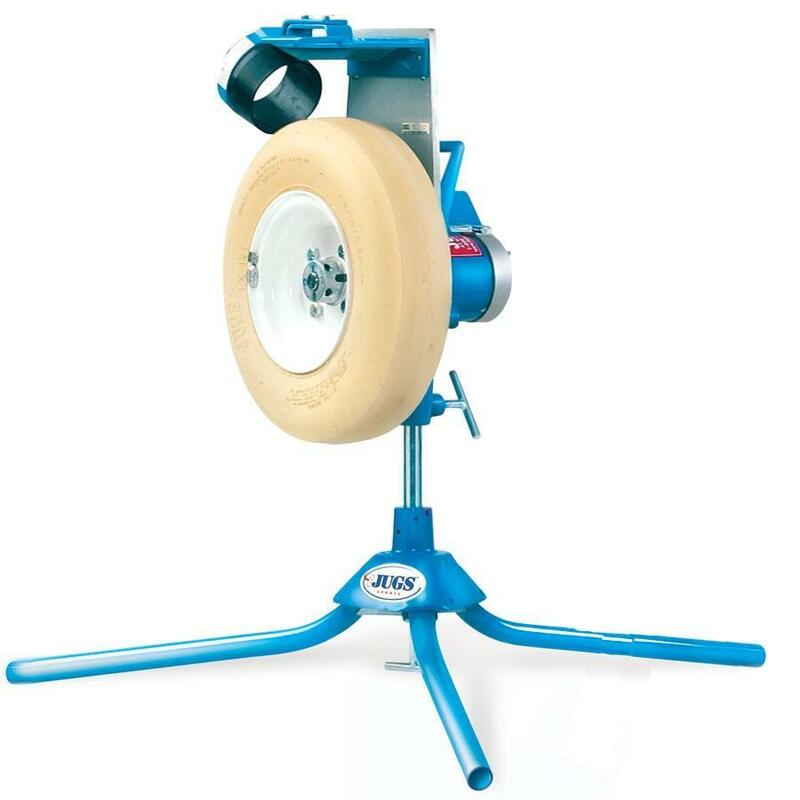 While other pitching machines are designed with bulky frames thereby bringing an unnecessarily excessive weight, the Junior Baseball Pitching Machine from Jugs has a straight-forward design that cuts out a great deal of weight. This makes the product uniquely lightweight consequently making it expressly portable and mobile. The machine’s swivel design has a 360-degree movement for the player’s convenience depending on the pitch you are practicing on. The product is classically designed to throw balls in various movements including sliders, fastballs, and curves. One of the top highlights of this product is that it has a precise ball throwing speed. This goes a long way in enabling players to work on their batting speeds and hitting accuracy by having balls thrown at them at different speeds. The precise speed feature coupled with the machine’s digital readout display makes it exceptionally easy to use the product for all your batting practices. Whats more classy about the machine is that it has a patented delivery system that allows you to see the ball right from the machine up to when it makes contact with your bat. Since the machine features a simple design, it is not only easy to set up but also portable. As such, you need not to worry about moving the product from one point to the other especially if you practice away from home. You do not need to possess any special skill set to set up the product. The instructional guide that comes with the machine has stepwise instructions and guides on how to set up. Disassembling the product is equally effortless and takes a few minutes. However, care should be taken when assembling and disassembling as handling the product carelessly can lead to some of its parts breaking down. 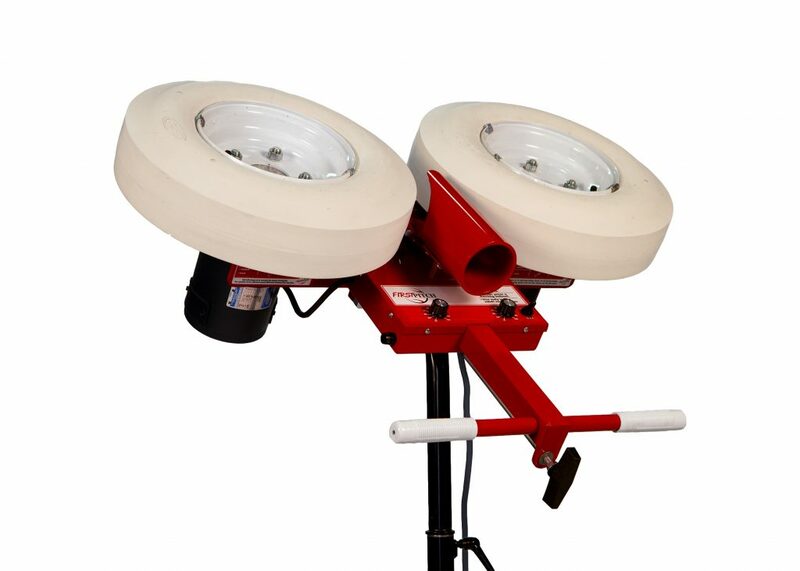 This Jugs Junior Pitching Machine throws 9” baseballs at speeds of between 15 and 60 miles per hour depending on the players’ preferences and settings. You can use the digital speed readout in the product to vary the speed to your desired specifications. The product is specially designed by youthful players aging between 8 and 15 years. Professional players and players in college leagues may not find the product useful in honing their batting skills. You should care and maintain this product accordingly since like other pitching machines, it is bound to wear out with time. As such, you should maintain it in pristine conditions and service it regularly to ensure that all its parts are functioning optimally and in the best way possible. Highly efficient with exclusive features and functionalities. The speed of the balls being thrown can be varied. Throws regular 9” baseballs and hence you do not need to purchase any special balls. It is electricity powered hence its use is limited to pitches with electricity connection or with generator power. The features of this First Pitch Baseball Pitching Machine are unmatchable. The machine can throw all types of pitches imaginable including changeups, sliders, and fastballs. What is more amazing about the product is that it also throws complex balls like knuckleballs, screwballs and even curves. The product is a worthy investment since it can benefit all the members of a baseball team with the inclusion of infielders and outfielders. This product is able to attain professional speeds of up to 105 mph. This in turn makes it easy to polish your batting skills especially if you are practicing for a league or a major competition. The incredible swivel function in this First Pitch Machine makes the product convenient and easier to operate than most other competing models. The swivel function in the machine is combined with a side-side adjustment that provides for tire angling for purposes of throwing different pitches. This comes in handy for players who use both hands for batting and are practicing for a major competition. Additionally, the ball turret feature in the machine makes it possible for the machine to throw both right and left-handed pitchers. The frame in this First Pitch Machine is made from a strong metallic material that contributes greatly towards the machine’s firmness and stability when pitching balls. In addition to this, the frame comes with an anti-corrosion resistant material that allows for the use of the machine in wet weather without the machine rusting or corroding on its surfaces. The well-designed frame and overall construction of the product make it reliably useful for all batting and pitching practices. Another feature of this product worth mentioning is the fact that it can be customized to throw curveballs, knuckleballs, sidearm curves, sliders and fastballs according to the player’s settings and preferences. You can also vary the speed to suit your playing style as well as the type of practice you are doing. The top speed is reserved for pro players who have mastered batting perfectly and are therefore able to accurately hit balls thrown to them at high speeds. Ideally, the machine has all the power, accuracy and potential you need for practicing against different pitches and curve balls. This incredible pitching machine for pros comes with two powerful (1/3) motors that boast of having an outstanding capability of throwing balls consistently at high speeds. The motors are designed and developed in a way such that they cannot break down during practice thereby providing players with reliable service throughout the machine’s life. The most fascinating aspect about these motors is that they throw both traditional stitched balls and dimple balls. Therefore, if you have either of these balls, you can use them with the machine. Uses regular baseballs and hence you do not need to invest in any special balls for the pitching machine. Easy to set up and use. This product does not require players to possess any special skills to set up or operate it. Comes with a one of kind digital speed readout and is safe to use even for kids and youthful players. Performance of the machine is limited to an electric power supply or its equivalent. When shopping for the best baseball pitching machines to invest in, it is necessary to familiarize yourself with the different types and classes of machines available in the market. Ensure that you only settle for machines that will be beneficial in helping you to refine your skills. In addition to this, you may want to stick to high-end machines from reputable brands. This is because these products are known to have unrivaled performance, limitless functionality, dependability and ultimate durability. Avoid purchasing cheap quality brands as they may turn out to be quite expensive in the end. If possible, purchase all-round pitching machines that can be used by players on different levels including amateurs and professionals.